You can purchase a Teddy bear shaped balloon and place it as a surprise on your bed on Valentine’s morning. 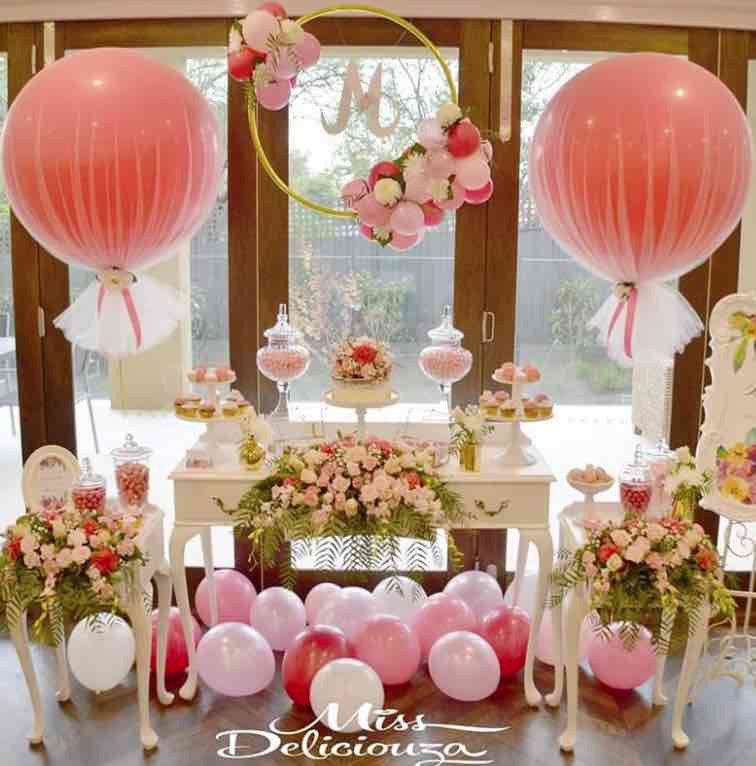 Accompany the teddy balloon with variously coloured round or heart shaped balloons and flower decorations around the room. You can easily get teddy bear or hello kitty balloons on good online portals. Many of these are easy to blow with just a few puffs of air and would not even require Helium. 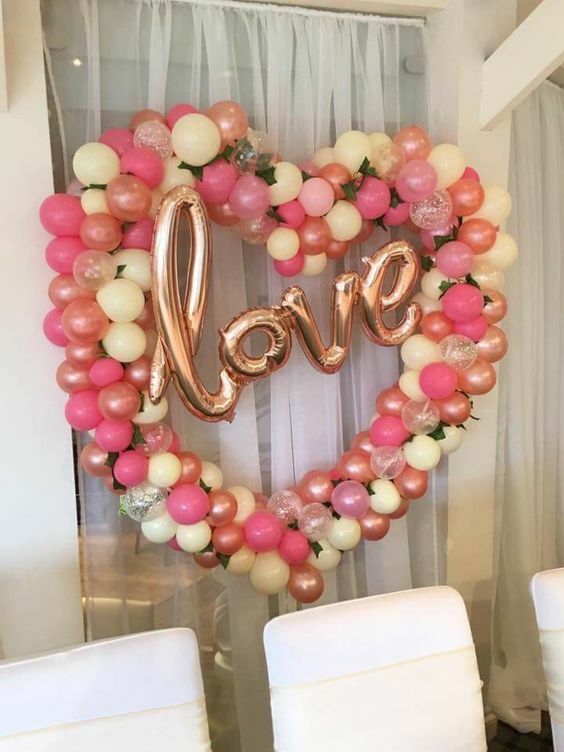 A dining room filled with Red, White and Pink coloured balloons that are Heart shaped is a perfect decoration idea for the upcoming Valentine’s day. You can purchase balloons in various sizes. You can pick the simple variants or those with Helium to fill up your room. Add special touches by lighting up scented candles for a lingering aroma around the room for a romantic dinner. 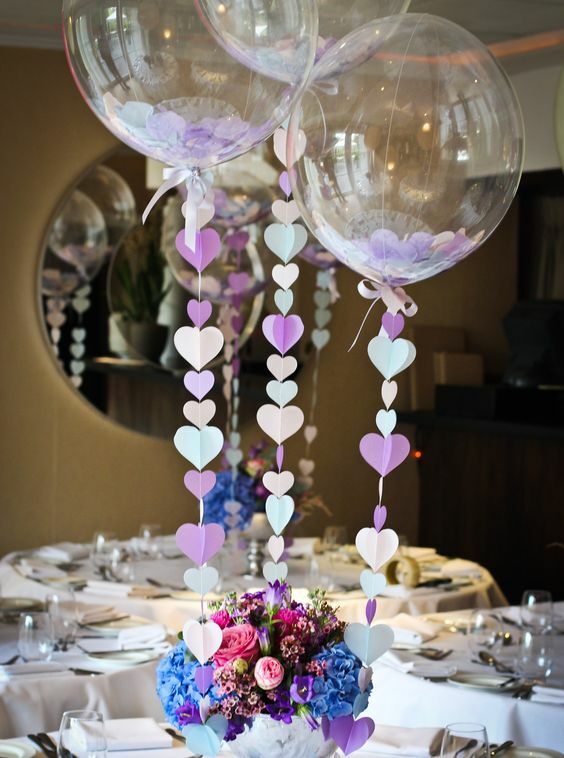 Create a Balloon centrepiece for your dining room by putting a bunch of Heart shaped balloons mounted on sticks in a flower vase. Surround with aromatic candles, a nice flower arrangement, glasses of Champagne and sweet treats like cupcakes. This is a practical and quick idea for a dash of romance around the dinner table. 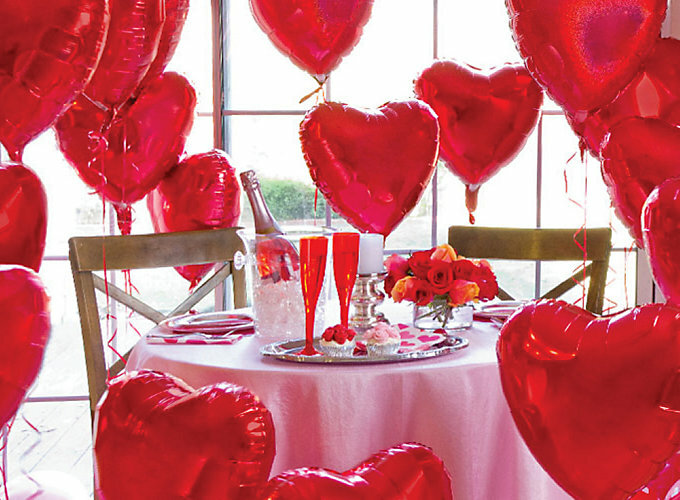 If heart shaped balloons are not your thing, pick simple Balloons with Polka dots or hearts. Decorate a bunch of these with a Valentine’s themed gift bag and may be a cute Teddy bear or any other soft toy that your sweetheart likes. This sweet setup can be done literally anywhere from bedroom to lobby. You can tie the balloons to the gift bag itself. 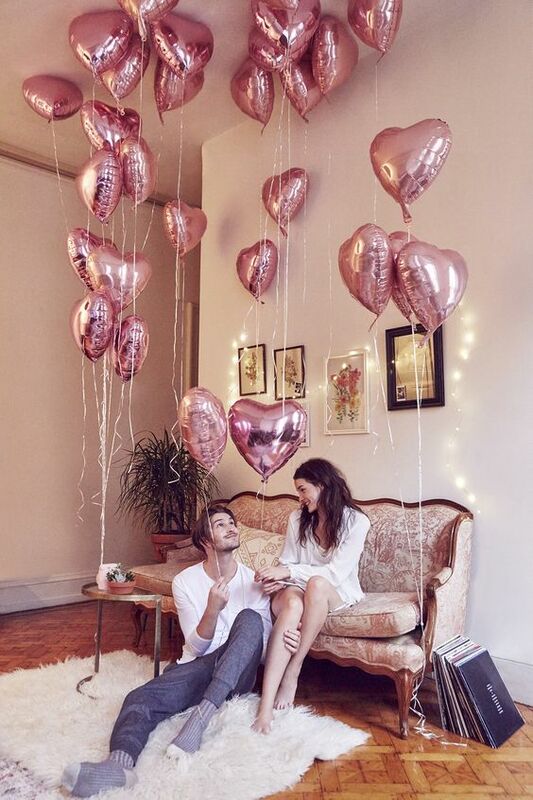 Turn your bedroom into a love den for this Valentine’s day and add decorations, such as balloons, candles, tea lights and flowers to the room. You can tie of tape fun notes, short love letters. You can use sticky notes to write your messages and stick them to the ends of the curly ribbons, which are tied to your balloons. 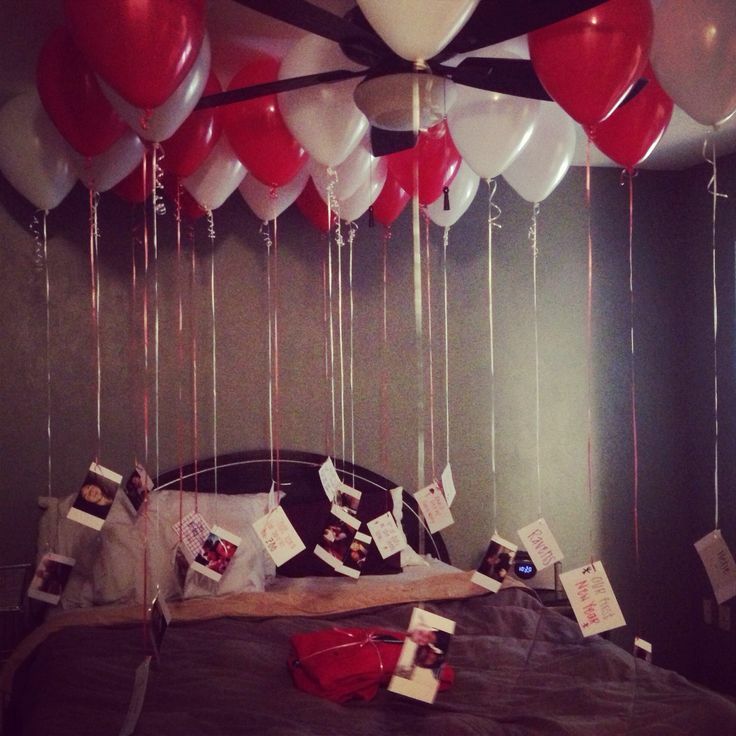 Decorate the entire floor of your bedroom with balloons. This arrangement looks beautiful and you can plan for a special movie night with your loved one and enjoy some snacks and desserts. This one is rather simple to do. You simply need to place a flat table against a wall of your home. Decorate and highlight the wall using balloons. You can create a Balloon arc or a Heart shape for Valentine’s day. Spread a nice sheet on the table and use it to display Champagne, Macarons, Pastries or Cupcakes. 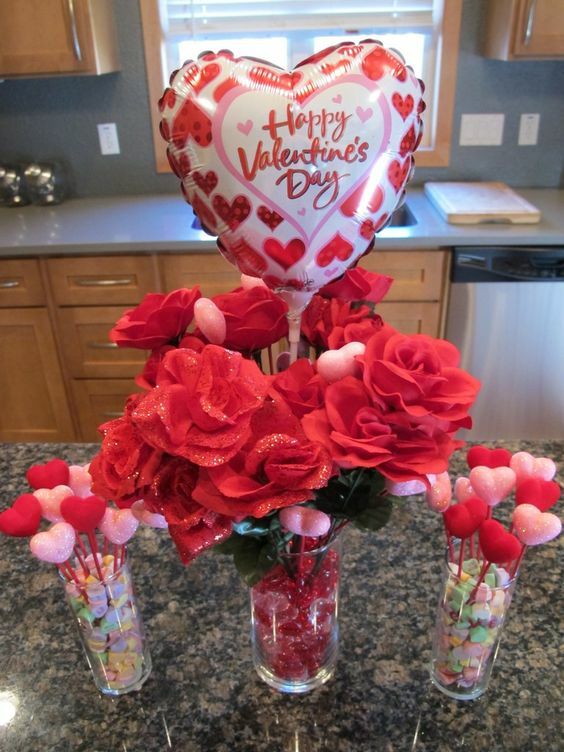 Create a Sweet treats corner, especially for your Love!! They say, the way to a man’s heart goes through his tummy. Well, kitchen is where you do all the cooking, right? So, on Valentine’s day, it makes perfect sense to decorate the Kitchen. Create a special corner on the Kitchen shelf using a couple of vases where you can keep heart shaped chocolates, candies and cake pops along with a couple of stick Balloons and Roses. You and your partner can cook a small meal together for the special day and relish it together. Use a washable colour pencil to create outline of a heart on any chosen wall of your bedroom. 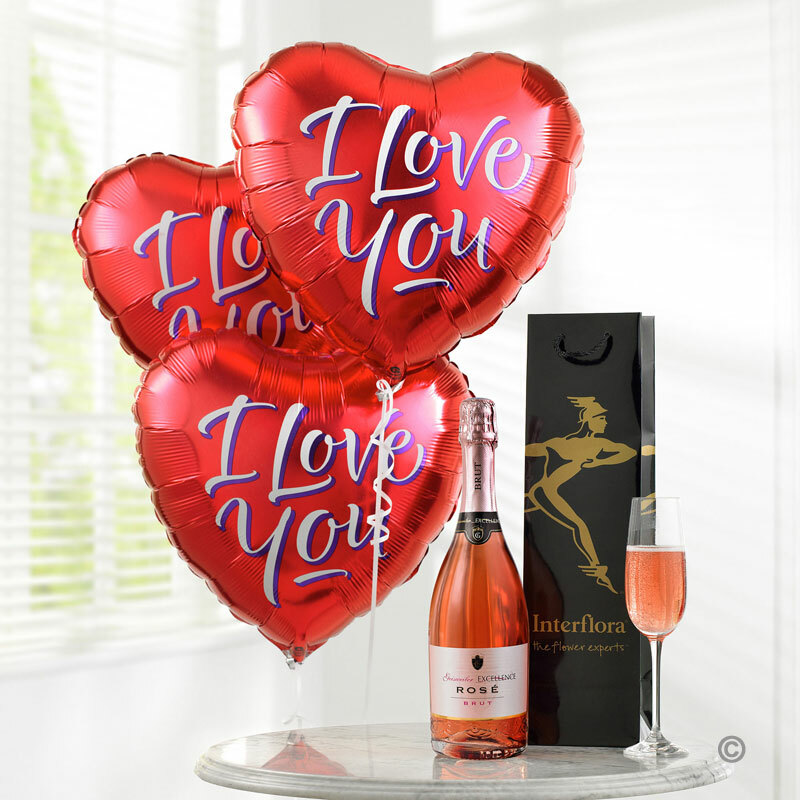 Use various balloons, either in a single colour or a gradient of a particular colour like Pink or Red to create a beautiful heart shape. You can take help from the tutorials online to do this. This 3 D arrangement looks beautiful to look at and your partner is sure to appreciate all the hard work that goes into it. 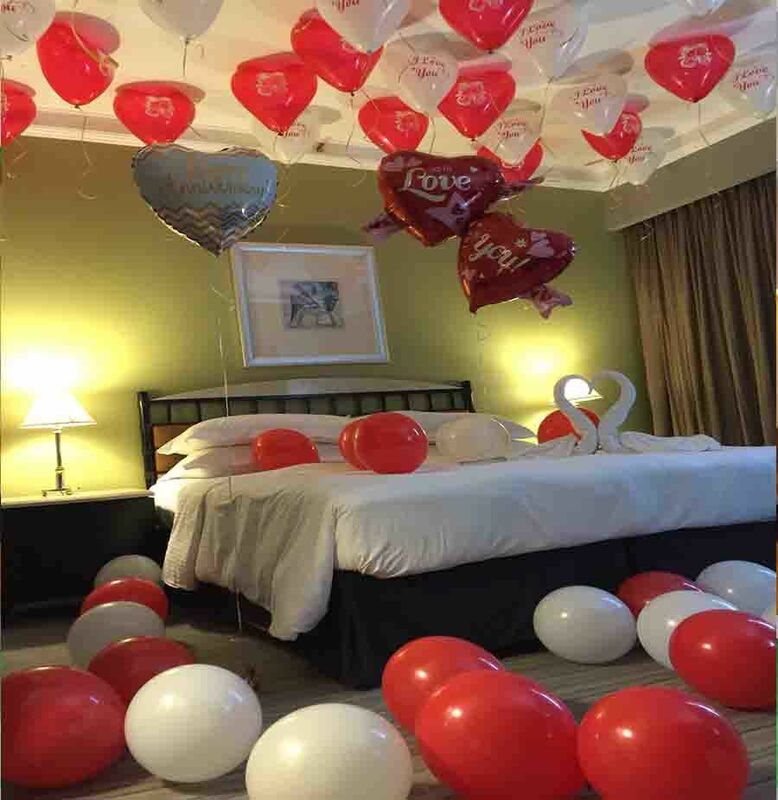 You can also arrange the Balloons on a Heart shaped cardboard and then mount the board on the wall. The Helium filled Balloons have a beauty of rising up. This way, their threads or strings can be used to create a beautiful effect around the room. You can arrange a series of Hear cut-outs to the strings of the balloons or can even use Curled up Ribbons for the strings!! Mostly, it is the ladies doing all the cooking chores. So, men can be a bit sensitive and cook breakfast for their Women on Valentine’s day. You do not need to be a master chef, a plain veggie sandwich and her favorite smoothie along with Flowers and Balloons would be great!! 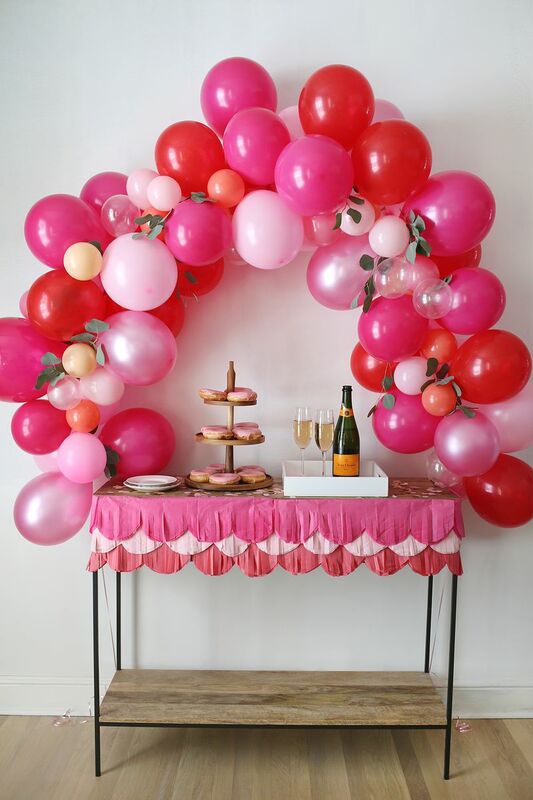 Tie the balloons to the legs of the breakfast table. A bunch of balloons hanging from the ceiling along with a couple of inflatable hearts and cupids would make for a treat to the eyes. You can take help from a friend for this arrangement. Frills have a wonderful ability to give a dreamy feel to decorations. 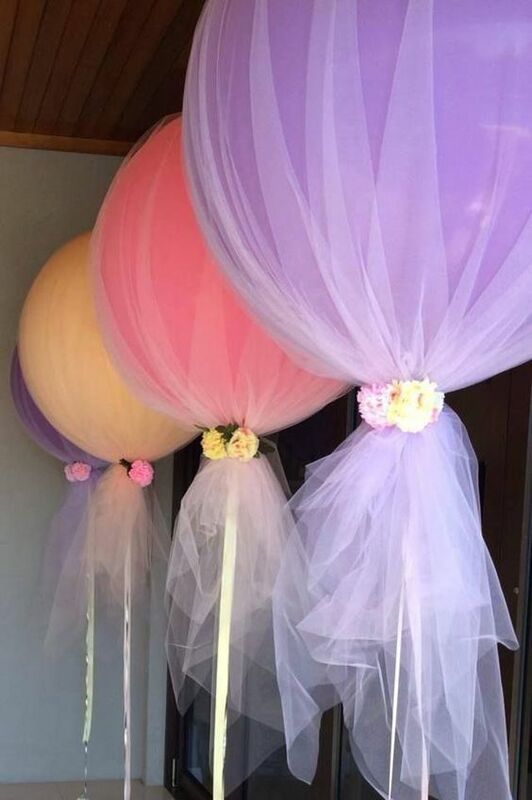 Use net frills to cover up your balloons and your decorations would look nothing short of amazing. To secure the net, you can use flowers or fancy rubber bands or even pretty ribbons. 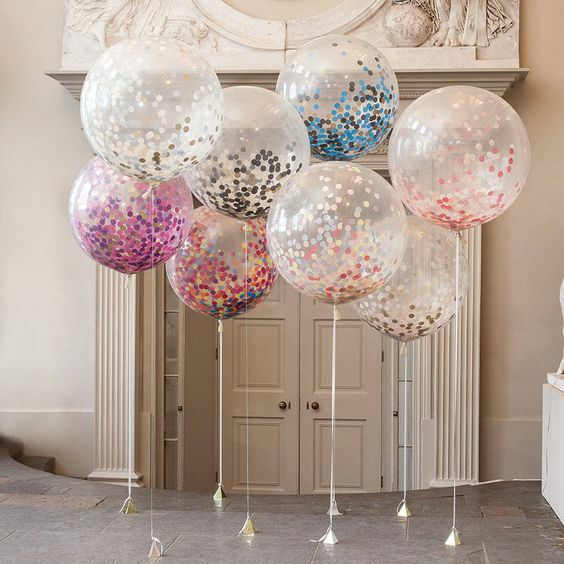 Decorate your Balloons with confetti to give your plain balloons an interesting twist. 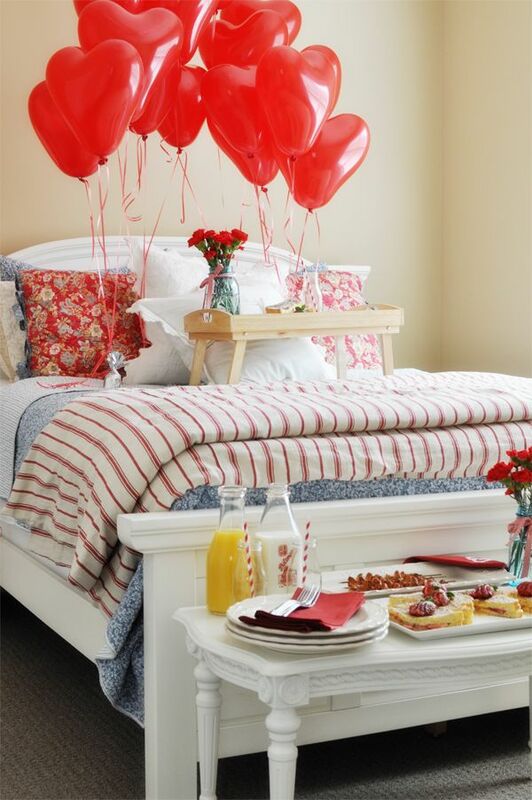 Arrange the Balloons in a heart shaped pattern. Use the inflatable letters “Love” to decorate an accent wall of love in either bedroom or dining room. You can special effects in the room by adding tea lights and fairy lights. 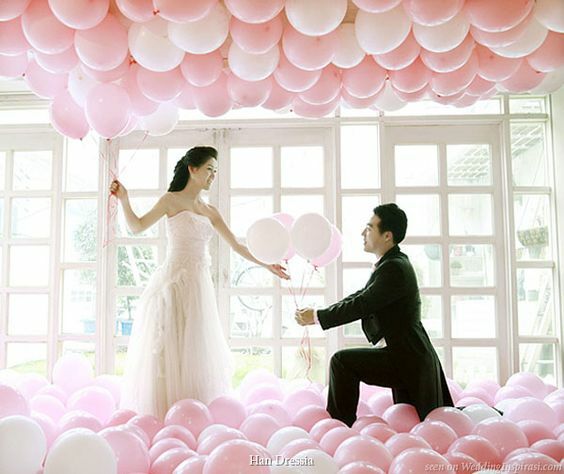 So, these were some of the amazing balloon decoration ideas that you can draw inspiration.